If you enjoyed the light version of our Project Management Excel Gantt Chart template, you can now get the pro version here. This version is compatible with Excel 2007, 2010, 2013. For previous versions of Excel please tell us what you need or check our main project management page. If you are unhappy with it, we would be glad to receive your feedback and make changes that would improve the project management gantt chart. Here the features of the Pro Version. Enter the tasks in workdays or calendar days. Choose what ever color you want for your tabs. 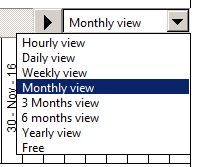 Change view to Hourly view, Daily, Weekly, Monthly, 3 Months, 6 Month and Yearly. You have also the possibility to enter a free range. This feature is only found in our Excel Gantt chart template and non other on the market. This allows for a great customization of the display and makes your timingchart much easier to read. Subtask dependencies like in the foundation task here under where the task 2.1 is dependent of the 2.1.1 to 2.1.3. Excel Made Easy was founded in 2008. Excel Made Easy is a service to people looking to learn Microsoft Excel or any other spreadsheet SW on the market. We endeavour to provide the best service and support and to respond quickly to your questions. Copyright © 2018 Excel Made Easy All Rights Reserved.